Sprung from The Big Idea Competition, and Neal Jackson’s story idea ‘The First Aeronauts’, Emma Carroll’s latest historical fiction sees her entering the world of France in 1783, when the Montgolfier brothers launched the first hot air balloon flight over Versailles. Carroll has woven their story seamlessly with a wonderful adventure narrative that manages to be fresh and modern, incorporating ideas of gender politics, science, identity and social class. Although Sky Chasers is fiction, Carroll writes with an acute sense of history, with huge attention to detail and period. Magpie can’t believe her eyes when she sees a boy dancing in the sky. When she realises that he’s ‘flying’, hanging onto a rope from the prototype balloon, she knows she wants a part in it. Of course, it’s not that simple for an orphan girl, especially when the boy is the son of Joseph Montgolfier, and she’s already been inside their house – thieving! Integrated in the plot of how Magpie, her rooster, the boy Pierre, and his duck end up in the first balloon flight over Versailles are all sorts of elements, including pistols at dawn, suspicion of English spies, and mistaken identity. Carroll has great fun bringing in period details and playing with historical character – the reader first meets Marie Antoinette eating cake at Versailles. There is also the wonder of science and invention. The Montgolfier brothers have made headway by the time Magpie arrives, but Carroll plays with Magpie’s powers of observation allowing her to spot details they might have missed. She has the idea for lift from undergarments drying in the kitchen for example. These ‘accidental’ details feed into the invention of balloon flight, and bring science down to a basic, and yet exciting level. Invention, quite often, comes about by accident. A baddie lurks in the background of the novel too, underpinning the suspense – difficult sometimes to conjure in historical fiction where the outcome is already known. But here, the baddie is not all as she seems – indeed there are many cases of mistaken identity within the novel, both good to bad, boy to girl, which makes the reader think carefully about each character’s motivation, intention and ambition. 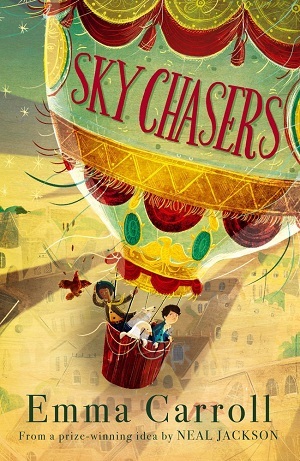 Carroll has also pinned down the Montgolfier brothers quite spectacularly despite her brevity, as in this story they are but secondary characters to the children. Add to that a profound sense of alienation and belonging, be it nationhood, social class or family, and the reader sees that this is an adventure novel with multiple layers. Carroll is a master of historical fiction, painting a vivid picture of the time with colour and period detail, but also bringing in themes, such as belonging, that still resonate today. But above all, it is the wonder of flight that pulls in the reader. In fact, reading the fantastic description of flight, one can see how this melds into the view an author might have of their novel – as Magpie sees the gardens of Versailles and fields beyond laid out beneath her like toys, so the landscape of a book enables the author and reader to garner a larger world view, an encompassing picture of who they are compared to history. The power of possibility is held aloft in this soaring novel. As it is sent wind borne into bookshops, you can catch your own here.